I had questions regarding this plant and called customer service and they immediately helped me and even placed my order over the phone. I will definitely use them again. 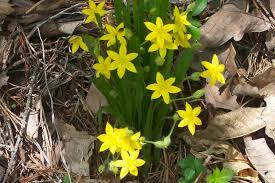 Yellow Star Grass beautiful perennial wildflower that loves full to partial sun. Makes an attractive covering for garden beds, open woods, or fields. It likes moist and slightly dry soils, mainly if they contain sand, rocks, or loam. When not in bloom, the plant appears as tall grass making it a tremendous yearlong addition to any landscape. Growing zones for this hardy yellow flower are 3 to 9. Yellow Star Grass can often be mistaken for weed, but when the spring and summer seasons come, its slender green leaves thrive and bloom with starry bright yellow flowers. In the wild, this delicate woodland plant can be found in soils that are acidic. Often spotted in prairie openings, it can be quickly grown in garden beds given the adequate care. This warm-season perennial flower is well-suited in rock gardens, yet it also adapts nicely to clay or sandy soil. Its preference is full sun to partial shade, and as long as you don't overwater, it can spread into large beautiful colonies that thrive over time. As long as adequately controlled, it is not invasive. The blooms that sit atop the hard, hairy grass-like stems, often reaching about 12 inches in height, attract pollinators like butterflies and bees. These creatures are beneficial in any landscape as it is an evidence of a healthy ecosystem. After all, plants and wildlife are strictly dependent on each other. This bright yellow wildflower, with its leaves and stems dusted with fine white hairs, is a member of the lily family. They are best enjoyed in the garden when they are in full bloom in May-July. Star Grass is a beautiful wildflower and will have very small dainty looking blooms. They will be bright yellow when in bloom and will look amazing. They will supply gardens and natural areas with lots of colors. This plant will love wet conditions. This plant will also have leaves that resemble a bamboo plant.